Inside the fight continuum there are a number of other continuum’s or concepts. There is a reactionary concept, the take off concept, the movement concept, the retention concept, the draw stroke concept, the sight concept, and the grip and trigger concept. React as you need to react, take off as the need to take off, move as you need to move, draw as you need to draw, deal with the retention problem as you need to deal with the retention problem, see what you need to see, and work your grip and trigger as you need to work them……. within the context of the specifics of the fight. This is very straight forward and simple, yet each of these are intertwined. Each works in conjunction with the other and each has an effect on the other. The dynamics of the fight will be dictated by your position in the reactionary curve, the proximity of the threat, and the urgency of the situation. How you deal with the specifics of the fight will depend on your mindset, experience, training, and skill level. When it comes to training and skill level, I believe that we should strive to be as well-rounded and versatile as possible, to understand the fight continuum thoroughly and to cover as many bases as possible within that continuum. There needs to be a priority set on “the most likely situations.” But training should not stop there. We have already discussed the reactionary concept in great lengths. The next concept that we are going to look at is the movement concept. Necessary movement is all about the perfect balance of “to hit and to not be hit.” The higher the chances are of being hit, the more you should move. On the other hand, the lower the chances are of being hit, the less you should move. I have broken the skill sets into five categories. Stand and Deliver is the entry-level skill set, this is where you nail down your fundamentals. You should have “stand and deliver” skills down cold to truly excel in the skill sets that follow. 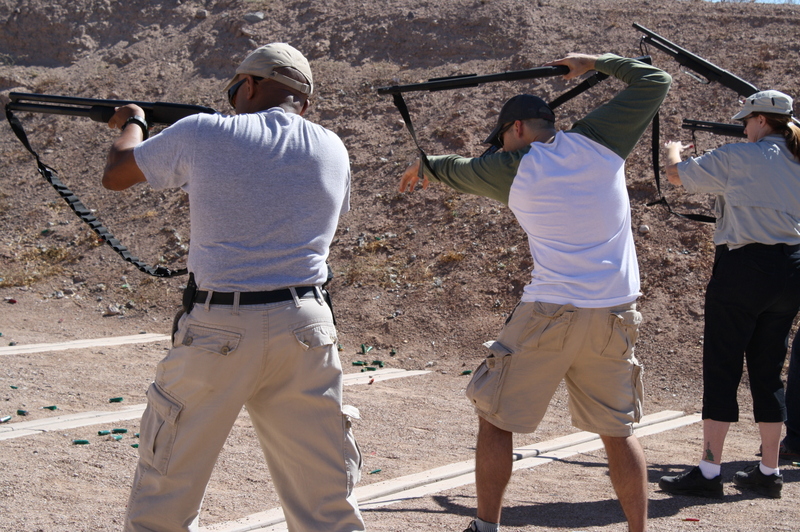 This form of movement works very well inside of the proactive gun fight and from the dominant position. Stand and deliver can also be a very advanced tactic, employed by truly exceptional men. Many very good men have made it home after some very tough nights using a stand and deliver skill set…. a few of them I know personally. One should not discount this skill set when it is used within the correct context of the fight. Knowing exactly who you are within that context of the fight may allow for you to accomplish things that are simply not possibly for the majority of people who carry guns on a daily basis. There is no doubt about the importance of “stand and deliver” skills. I have spent thousands and thousands of hours on this skill with hundreds of thousands of draw strokes. If I chose this solution to the problem, that skill will be there. If you are in ahead in the reactionary curve inside of a fight, focus on your marksmanship and dominate the fight with well paced shots with solid ballistic effect. Movement degrades accuracy ,only move when the perfect balance “to hit and to not be hit” dictates that you move. Controlled movement is an intermediate skill set, which would include many of the skill sets that are commonly taught inside of the Modern Techniques. They include “just walk,” “the side step,” (crab walk) and “the Groucho” (duck walk.) Controlled movement has it place when the urgency is not very high and the proximity/distance requires more precise shooting (sighted fire.) Controlled movement is designed to allow for the use of the sights, everything is smoothed out as much as possible in order to be able to achieve a sight picture. This smoothing out process leads to a very slow form of movement and these slow speeds need to be accepted for what they are. Inside “the balance, to hit and not be hit” controlled movement priority is more toward making the hit. The ability for an adversary to track you and put hits on you does not require a high skill level. It is my opinion that controlled movement is best when used outside of seven yards or when the difficulty of the shot requires some form of precision. The “just walk” concept is an entry-level movement concept in my opinion. While it does work well marksmanship wise, the speed potential is extremely lacking. Due to the upright nature of the movement, there is very little “smoothing out” potential, so the ability to use the sights is very much dictated by the slow pace of the movement. I have real concerns about this upright nature. It does not take into consideration the physiological effects of incoming rounds and the body’s natural desire to make itself a smaller target. The “side step” is a decent form of movement that is designed for specific situations. The number one situation would be geared towards the use of a ballistic vest. 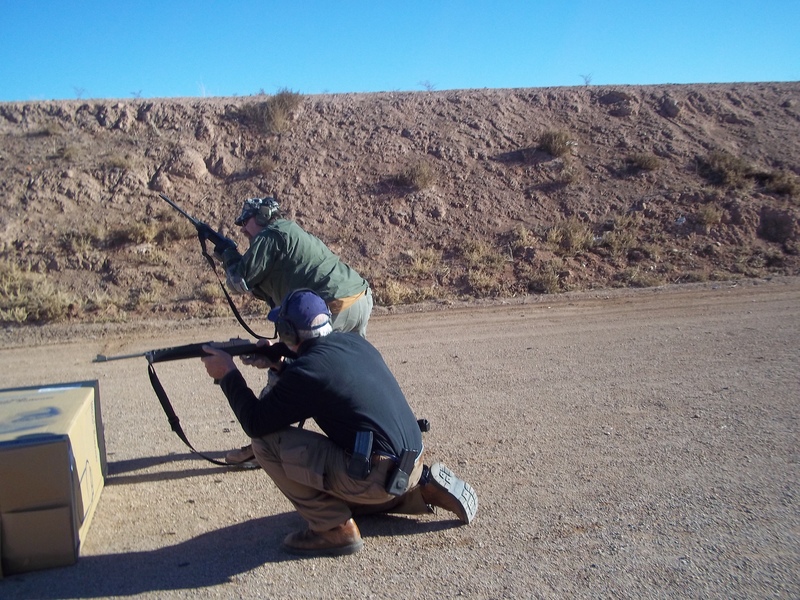 By staying squared up to the adversary, one is able to get the ballistic plate in the front of your body. The second situation is for the use of a stable two-handed shooting platform. We must accept the fact that many people have very limited skill sets. They only know how to shoot in this single manner. It is my opinion, that without the use of a ballistic vest, the side step is a “lowest common denominator” type of movement. The “Groucho” is a very high quality form of controlled movement. The application of the lowered base, the bent knees, the rolling off of the heel/toe, in conjunction with the turret of the tank concept leads to a very nice skill set that dove tails perfectly with the dynamic movement concepts. It puts to use the exact same concepts, with the ability to give outstanding precision. This type of movement has your upper body working independent from your lower body, “like a turret of a tank.” Toes point the direction you are headed, body turreted the direction that you are shooting. This type of movement brings your ambidextrous skills into play. Shooting to the firing side can be done two-handed to a certain point, eventually you need to go one-handed. The possible speed out of this type movement can cover the full spectrum, but the faster you move the less ability you are going to have getting to your sights. 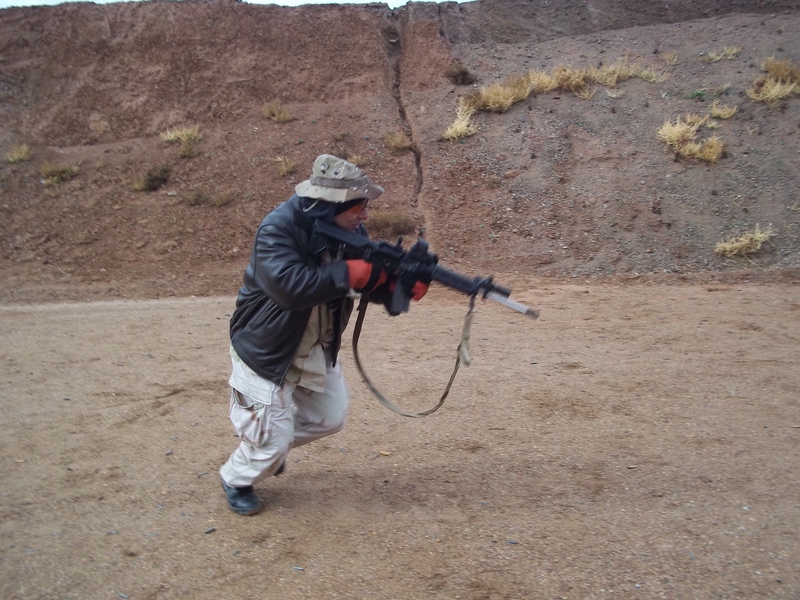 This form of movement also works perfectly with the physiological desire to make yourself a smaller target when you are taking incoming rounds. Move/stop/shoot/move is another form of movement that can be use outside of seven yards and when cover is not readily available. I see this as low priority skill set, but one that can be employed effectively if used in conjunction within “the rifleman rule of three” (I’m up, he sees me, I’m down.) This skill set is often advocated by those that simply do not own “point shooting with dynamic movement” skill sets. Since they are limited in their knowledge base and skill level, this is the very best that they can do. If you find yourself to be a limited to a squared up, two-handed shooting platform, this may be one of your limited options. If this applies to you, I would highly recommend that you seek out some form of training that releases you from the confines of that tight little box. This form of movement does not do well inside of a reactive gunfight inside of seven yards. Dynamic movement is a high quality and high priority movement skill set. This is where you will most likely find yourself when you are behind in the reactionary curve, the proximity is close and the urgency is high. This type of movement really works well when you are behind in the reactionary curve, in conjunction with your point shooting skill sets. The use of high level point shooting skills takes this skill set well beyond what has been considered possible in the recent past. The body mechanics of this form of movement is nearly identical to the Groucho, the combat crouch, the Pekiti take off, and huge number of extremely athletic base movement principles. The lowered base, the bent knees, the rolling heel/toe, and the toes pointed the direction that you are headed, in conjunction with an extremely fast turn over takes the dynamic movement skill set to an extremely advanced level. Since 2001, the advancement of this skill set has been one of my primary focuses. My student base now, makes what most people believe to be impossible, seem ordinary. “Get the heck out of Dodge” movement is simply sprinting to cover without engaging until you are behind cover. This has its place, especially inside military applications where distances are usually greater and long guns are the primary weapons. Its use by a civilian defender is becoming less and less desirable due to the huge advancements in the art inside of the dynamic movement skill, sets since 2001. If cover is a couple of yards away…..by all means get to it! But do not die trying to get to something that is just too far away, without making your adversary consider their own mortality. By the way Roger….love your posts! (your contact button is not working). 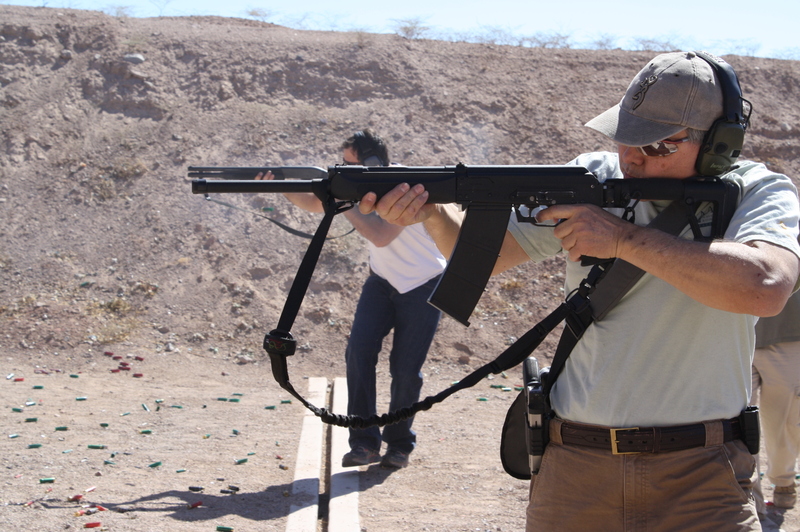 I took a one day shotgun class from you at the Boulder City Range and not only did I learn way more than you would think a one day class could bring…YOU were very dynamic and experienced. I mention you specially in my CCW classes.